Vietnam More Credit Worthy than Portugal and Spain? You may have read that European bond spreads have widenend to record levels but how bad is that really? To put everything into perspective, investors are demanding more premium to lend to Ireland, Portugal and Spain than to emerging countries in Europe and Asia. To be more specific, these 3 European countries that have made headlines on a daily basis are now considered less credit worthy (or are assumed to be a greater risk) than Romania, Lebanon, Vietnam and Indonesia. The following table shows the current 5 year credit default swap spreads for some of the major countries. Triple A rated countries such as the U.S., Switzerland, Germany, Denmark and Sweden have swap spreads less than 50bp. For those of you that are unfamiliar, the Credit Default Swap (or CDS) spread is the premium paid by a protection buyer to the protection seller over a length time. If a default occurs, the protection seller would have to cover the losses. The CDS spread is quoted in basis points per annum of the contract’s notional amount. 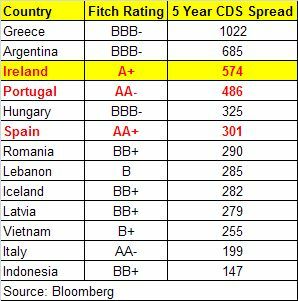 In case you are curious, the two countries that have the lowest CDS swap spreads and are therefore considered the most credit worthy are Norway and Finland.